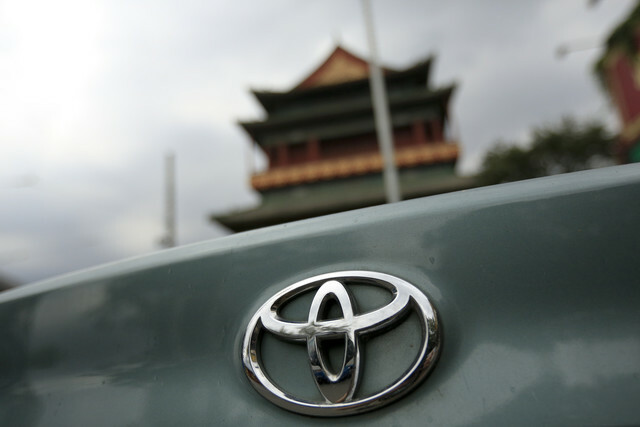 The Toyota Motor Corp. logo is displayed on a vehicle in Beijing, China. It took Wang Chongwei almost a year to rebuild his Toyota Motor Corp. (7203) dealership in Qingdao, China, after a mob protesting against Japan’s purchase of a group of disputed islands burnt down the showroom. Wang said he’s targeting to sell the same number of cars at the reopened dealership -- about 100 cars a month -- illustrating how Japanese automakers are working to return to last year’s sales levels even as the likes of Ford Motor Co. and Hyundai Motor Co. pull ahead. Intermittent bouts of tensions between Asia’s two largest economies also underscore the risks of a prolonged consumer backlash against Japanese auto brands, which have lost a fifth of their market share in the past year. Winning back the lost ground will involve increasing incentives that will pressure margins, according to consultancy Synergistics Ltd.
Nationwide protests erupted across China last September after Japan moved to purchase a group of disputed islands -- known as Senkaku in Japan and Diaoyu in China -- from their private owner one year ago yesterday. Thousands of Japanese cars were vandalized and businesses attacked by mobs in the demonstrations. The ensuing consumer backlash sent Toyota and Honda to their first annual sales declines on record in the world’s largest vehicle market. The dispute hasn’t blown over. Japan lodged a diplomatic protest to China after eight Chinese Coast Guard ships entered Japan-controlled waters on Sept. 10 near the island chain being claimed by both nations. According to Nissan Motor Co. (7201), the biggest Japanese carmaker in China by volume, its sales are down more than 6 percent in the country during the first eight months of this year, even as industrywide passenger-vehicle sales increased. Toyota’s deliveries have declined 5.3 percent in the same period, while Honda slid 2.9 percent. Toyota passed on Shanghai and Beijing and chose Dubai for one of its three new global Intersect by Lexus boutique stores, a key effort by the automaker to promote its upscale brand outside its biggest market of the U.S. Asked whether the anti-Japanese sentiment played a part in that decision, Mark Templin, the brand’s vice president, said last month in an interview that the company wanted to be careful about the pace of expansion in China. Honda said the political issue won’t affect its long-term plans in China and the automaker expects sales this year to surpass last year, according to Beijing-based spokeswoman Natsuno Asanuma. Nissan’s sales in China haven’t fully recovered, though it’s on track to achieve its plan this year, said Yoshiko Tsumagari, a spokeswoman for the Yokohama, Japan-based company. Ford Motor Co., unencumbered by geopolitical baggage, has emerged as the biggest winner, benefiting from consumers seeking non-Japanese options and an expanded lineup of new models. Deliveries at the Dearborn, Michigan-based automaker have jumped 50 percent in the first eight months of this year, driven by sales of its Focus compact and Kuga and EcoSport SUVs. The second-largest U.S. automaker last month introduced a revamped Mondeo mid-sized sedan aimed at Toyota’s Camry, Nissan’s Teana and Honda’s Accord. General Motors Co. (GM:US) and Volkswagen AG (VOW) are also stepping up investments in China as both automakers forecast their sales will climb to 3 million vehicles in the country this year. GM will invest $11 billion in China by 2016 and add four plants by 2015 that will boost capacity to about 5 million units. VW said in March that it will add seven car plants in the country, bringing the total to 19, and increase production capacity there to 4 million vehicles a year by 2018 from about 2.5 million currently. Despite the headwinds, China remains too big a market to ignore and Japanese automakers should play to their strengths in fuel economy to win back customers, said Satoru Takada, an auto analyst at Toward the Infinite World Inc. in Tokyo. That would mean wooing consumers like real-estate agent Lei Zhucheng, 43, who says tensions between the two countries aren’t a factor in his purchase decision. Back in Qingdao, Diao Zihui, marketing manager of the rebuilt Toyota dealership, said she wants to put the past behind her. The staff worked out of makeshift premises for months while the showroom was being rebuilt.